Happy Sunday! 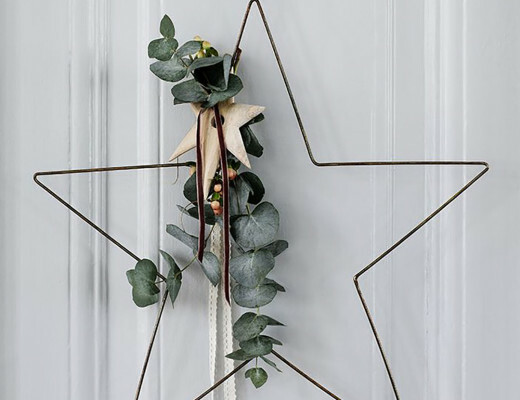 It´s probably one of my favourite days of the week (most likely because it´s considered OK to stay in your pyjamas all day… Or is that just me?!). Sunday is the ultimate day of relaxing, re-charging for a new week ahead, going for long walks (not in my pyjamas), and pampering. But when it comes to pampering and every day luxuries, I try to get that in every evening before I go to bed. 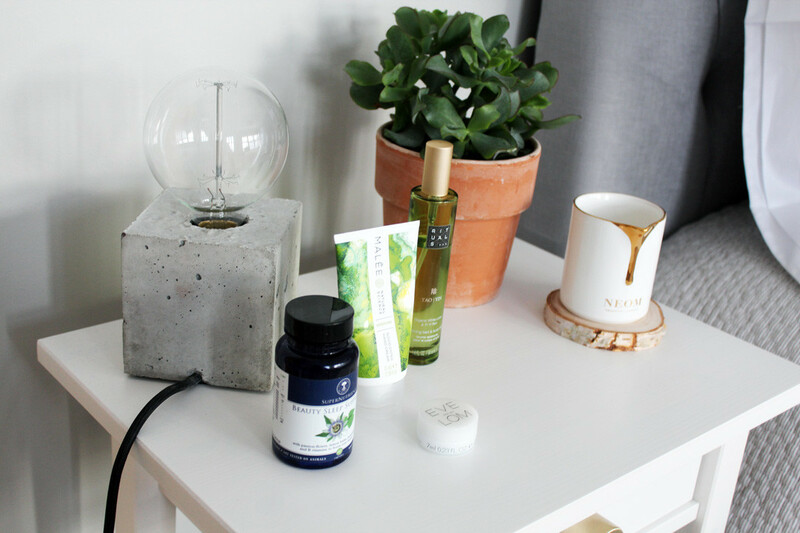 Hence why my bedside table is always filled with my latest beauty obsessions… Here are the ones I am loving right now. 1. I´m addicted to room and body mists. 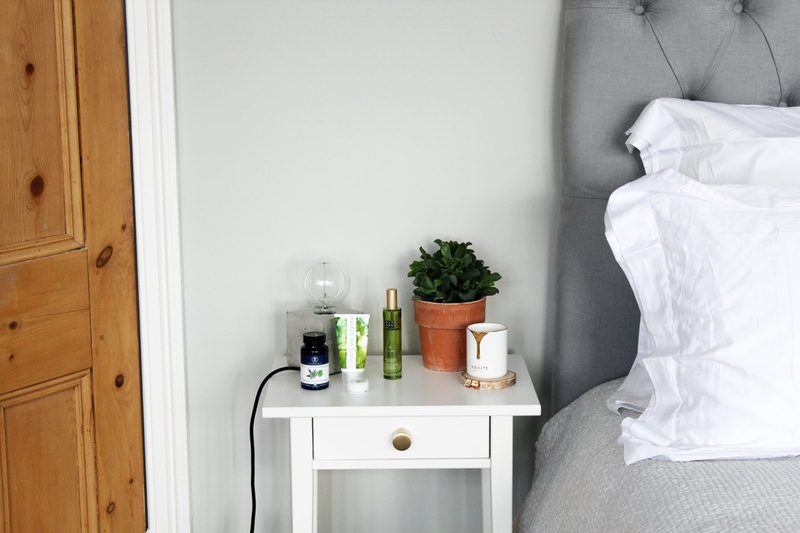 Right now I´m using the Rituals Tao Yin Calming Bed & Body Mist, enriched with calming and soothing ingredients to give you a peaceful sleep and creating that ideal zen bedroom environment. 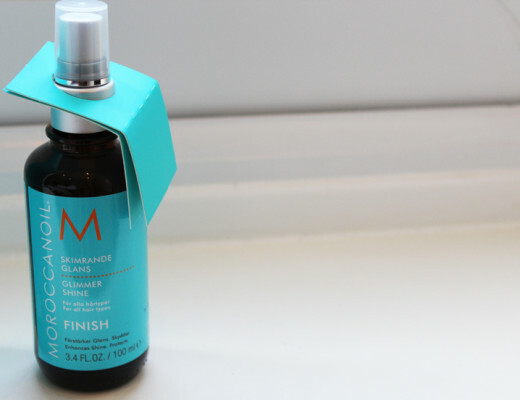 I spray it on my pillow (it doesn’t stain) and my body (it doesn’t contain any alcohol). 2. One thing that never leaves my bedside table, is a scented candle. 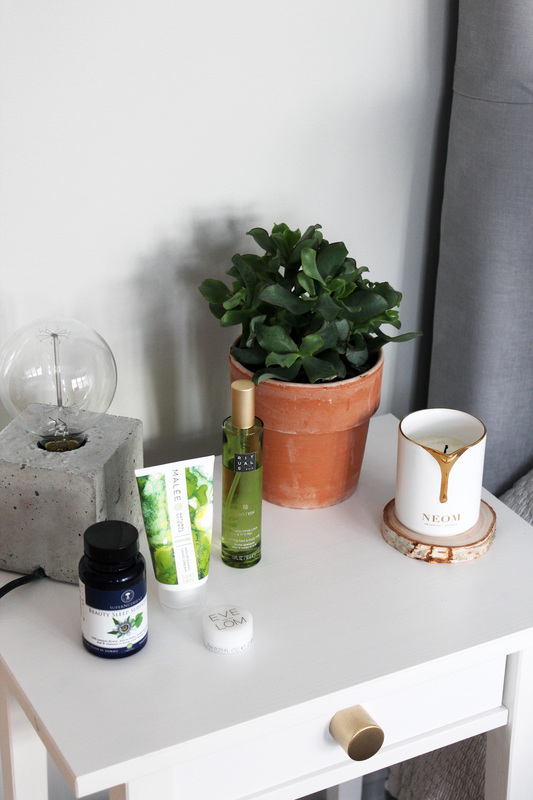 From Byredo, Jo Malone, Diptyque, The White Company, to my current obsession from luxury organic wellness brand, NEOM Organics, with their Intensive Skin Treatment Candle. 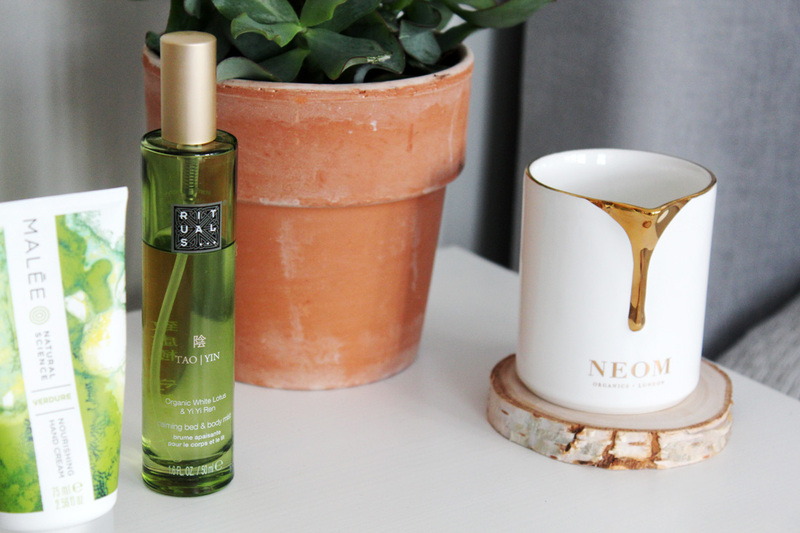 It´s basically a 2-in-1 product – after 30 minutes of burn time, the candle forms into an all-over nourishing body oil, with a blend of Cocoa Butter, Soybean and vitamin-rich Almond Oil help to soften the skin. Obsessed. 3. 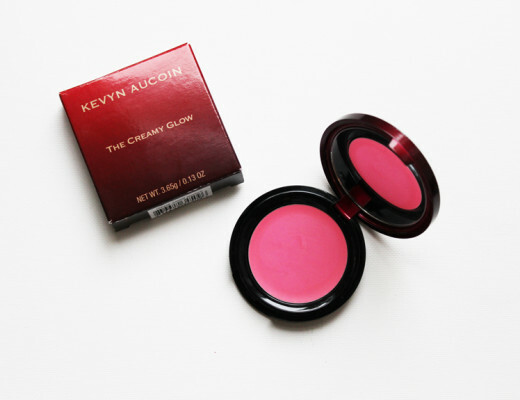 It´s during the night your skin has time to recover, heal and boost new cells. Hence why it´s so important to always remove all your make-up and mask your skin with moisturising ingredients – internally and externally. 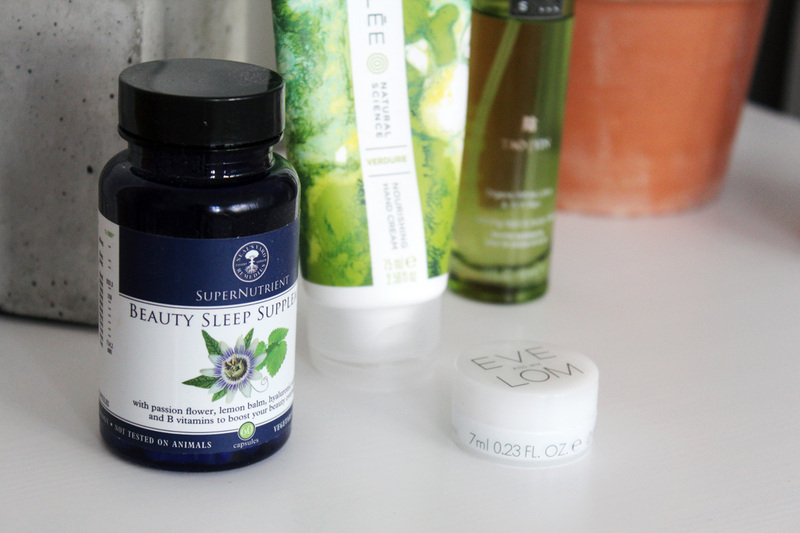 I´ve been taking the Neal´s Yard Remedies Beauty Sleep Supplement for the past month, aimed at skin, nails and hair, with regenerating hyaluronic acid which helps plump and moisturise your skin from the inside and out. 4. I keep my lips butter soft with Eve Lom´s Kiss Mix, a cooling menthol and moisturising beeswax balm, which helps protect my lips from dryness and chapping. 5. 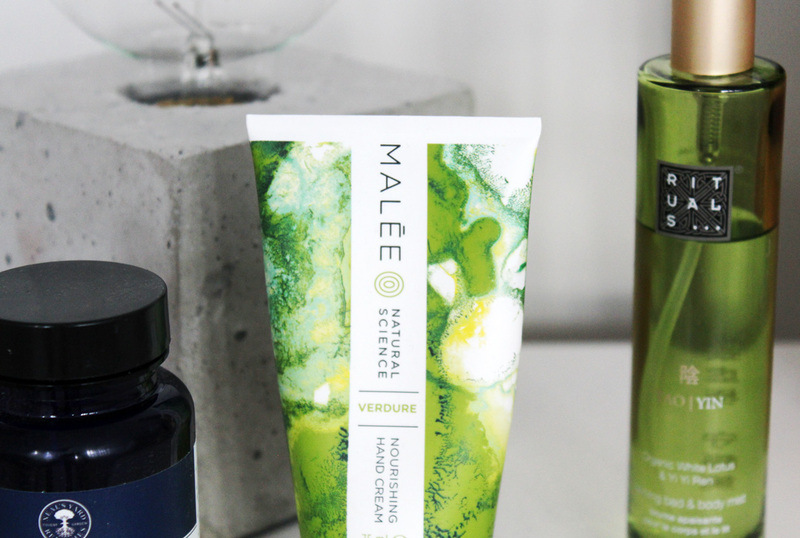 Last but not least, hand cream is another must-have essential, and recently I´ve been using one from natural skincare brand, Malée. With the super fresh green scent, it soothes and keeps my hands soft all night long. 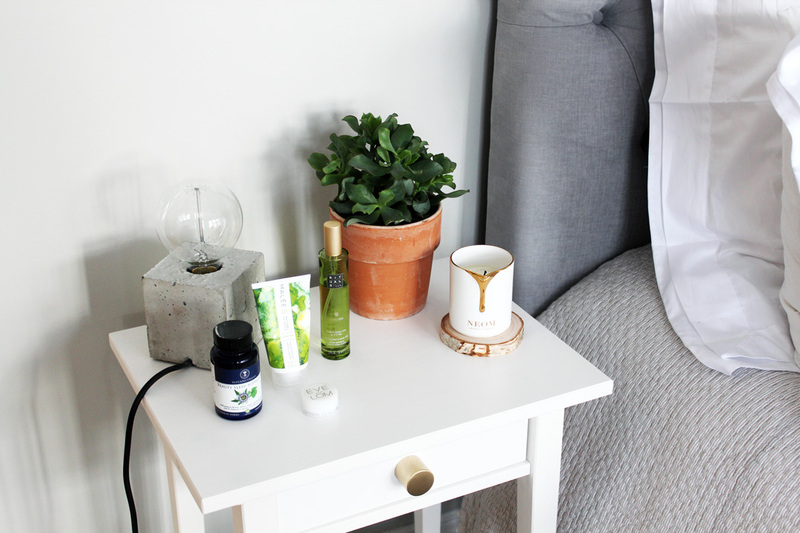 Such a dreamy bedside table, LOVE!